WORLD RENOWNED SCHOOLS The experience of the municipal infant toddler centers and preschools of Reggio Emilia is the subject of interest, research and exchange on the part of students, teachers, teacher educators, researchers, administrators, and political and cultural figures from Italy and throughout the world. The context and history of this community is highly regarded, rooted in choices made following WWII, pedagogical but also political, cultural and ethical choices which would support a new democratic society. GROUPS WITHIN NOVEMBER 2013 NORTH AMERICAN STUDY GROUP Among the many participants who will register individually or with others from their school or organization, there will also be two distinct groups represented within the November 2013 Study Group – a Five State Study Group and a group of Children’s Museum Teams. Five State Study Group Representatives from Arizona, California, Illinois, Missouri and New Mexico participated in a 2008 Study Group. Before, during and after that delegation, early childhood educators from the five states studied together, connecting and exchanging challenges and successes. They continue to collaborate at various levels as they apply Reggio principles within their different US contexts. There is a commitment to support each other, seeing each other as resources and developing a learning community among these five states. This North American Study Group is an opportunity for connecting and re-connecting among people from these five states as well as an opportunity for people from these five states to connect with other participants. Children’s Museum Teams This group of carefully constructed teams is being formed with strategic partners of children’s museums across the US to include higher education professionals, early childhood experts and civic leaders in various communities. Children’s museums hold a unique place in American culture – part educational, part cultural, part social – but all interactive and child and family centered. It is through this lens of the family learning unit in the environments and experiences fostered by children’s museums that their study will unfold. In partnership with local colleagues, children’s museum professionals will learn from Reggio educators and from each other how best to move their individual communities forward on their journey for healthy, vibrant and resilient communities. Opportunities for dialogue and exchange across the entire Study Group and with educators in Reggio Emilia will offer all participants many possibilities for gaining a deeper understanding of the 50 year history, challenges and accomplishments of the Municipal Infant Toddler Centers and Preschools of Reggio Emilia. 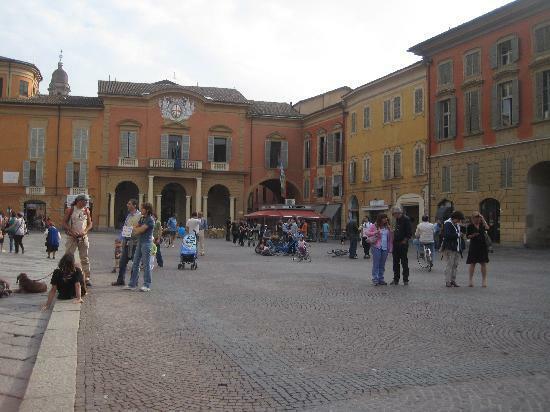 Since the establishment of Reggio Children in 1994, more than 200 study groups from 107 different countries (almost 4000 participants every year) have come to Reggio Emilia. . . . . “It was created to give greater value to a strong and distinctive characteristic of Reggio Emilia; the ability to lend listening, visibility and support to the rights and requests of children, young people, families and teachers. The Center is a dedicated meeting place where professional development and research intersect for people in Reggio Emilia, Italy and the world who wish to innovate education and culture. The per person amount is based on hotel accommodations in shared double rooms at 3 or 4 star hotels. Supplement for single rooms is $260 (see registration form). North American Reggio Emilia Alliance (NAREA) members receive a $100 discount. For membership information please visit: www.reggioalliance.org. Cost includes the program fee to Reggio Children, services provided by Angela Ferrario, US Liaison for Study Groups to Reggio Emilia and by International Study Tours, LLC. To accommodate our group, blocks of rooms have been reserved for 7 nights at 3 four-star hotels and 3 three-star hotels within 15 to 20-minute walking distance of the Loris Malaguzzi International Center. The three-star hotels are: Hotel San Marco www.hotelsanmarco-re.it Albergo Morandi www.albergomorandi.com and Albergo Reggio Annex www.albergoreggio.it. The four-star hotels are: Hotel Posta www.hotelposta.re.it, Albergo delle Notarie www.albergonotarie.it and Hotel Europa www.hoteleuropa.re.it. Check-in is: Saturday, November 9. Check-out is: Saturday, November 16. Rates for accompanying non-participants and for additional nights are available upon request. A very limited number of triple rooms are available. Please inquire if interested. Every effort will be made to honor hotel preferences while the priority is to keep groups from the same school/organization together. To reserve a space, please mail the Registration Form on page 5 and a $500 check deposit made payable to International Study Tours, LLC to: Angela Ferrario, 15 Beach Street Extension, Milford, MA 01757 no later than August 1, 2013. Confirmation and Invoice for Balance Due will be sent by email to each individual. Balance of payment may be made by check or credit card (Visa or MasterCard) and is due upon receipt of Confirmation and Invoice but no later than September 20, 2013. Please refer to Refund & Cancellation Policy. All monies are refundable in full minus a $75 processing fee until September 20, 2013. For cancellations communicated in writing to Angela Ferrario via email between September 20, 2013 and October 18, 2013, 85% of Study Group Cost will be refunded. For cancellations received after October 18, 2013, no refund will be due. Please book your own flights. Airfare is not included. Bologna Marconi and Milan Malpensa are the nearest airports to Reggio Emilia. Participants should arrange to fly on Friday, November 8, arriving in Reggio Emilia on Saturday, November 9 (departure from the U.S. is one day prior to arrival in Italy). Our first group gathering in Reggio Emilia will be the introductory meeting and welcome lunch on Sunday, November 10 at 12 noon. The Program will begin Monday morning and will end on Friday November 15 at approximately 6:30 p.m. Hotel check-out is Saturday, November 16 by 11 a.m. Please Note: It is recommended to be at the airport at least 2 hours before your scheduled flight departure time. If driving from Reggio Emilia, it takes approximately 2 ½ hours to reach Milan Malpensa Airport and approximately 1 hour to reach Bologna Airport, depending on traffic conditions. Allow more time if traveling to either airport by train and check train schedules in advance. Assistance with making private ground transportation arrangements between the airport and Reggio Emilia for groups traveling together is available upon request. Cost is additional. For privacy issues, participants are not allowed to photograph or videotape inside the infant-toddler centers and preschools, inside the Exhibition area and the Ateliers at the Loris Malaguzzi International Center, as well as during the presentations. Reggio Children’s policy allows the possibility to audio record the presentations. As part of the registration process and as a means of introduction please share a brief bio and your main interests in the Reggio Emilia philosophy and approach to education. Please send it as a separate document by email to: [email protected] by September 20, 2013. Per person cost includes double or single accommodations at a three or four-star hotel for 7 nights from check-in on Saturday, November 9 to check-out on Saturday, November 16. North American Reggio Emilia Alliance (NAREA) members receive a $100 discount. If you are a NAREA member check yes above and $100 will be deducted from your invoice. For membership information please visit: www.reggioalliance.org. [ ] Please find me a roommate, if possible. To reserve a space, please mail this Registration Form and a $500 check deposit made payable to International Study Tours, LLC to: Angela Ferrario, 15 Beach Street Extension, Milford, MA 01757 no later than August 1, 2013. Confirmation and Invoice for Balance Due will be sent by email to each individual. Balance of payment may be made by check or credit card (Visa or MasterCard) and is due upon receipt of Confirmation and Invoice but no later than September 20, 2013. Please refer to Refund & Cancellation Policy on page 4. This entry was posted in Investigating Choice Time: Inquiry, Exploration, and Play on May 31, 2013 by Renee.